Today, I'm doing one of my 'Loving Her Style posts' and although I usually pick a fashion icon and try to analyse what makes her style so amazing (my last was on Emma Watson, and you can also read my posts on Millie Mackintosh, Leigh Lezark, Mollie King and Zooey Deschanel). Today though, instead of a person, I'm going to be talking about a type of style that I can't get enough of at the moment. And that is what I'd call 'glam grunge'. The style combines the best elements of rock with those of the showgirl. It's a complete contrast, which is why I think it works so well. You take some elements of glitz and polish and mix them with other elements that are more dishevelled and distressed. This outfit is the pinnacle of daytime glam grunge! The beautiful fur could look a bit over the top but pairing it with the black skinny jeans and the sloppy, oversized tshirt is a genius trick. The hair, pulled into a messy bun, also gives a 'don't care' feel that's very cool and allows he fur to take centre stage. What a brilliant Glam Grunge outfit for a party. The sequin strides are such a glam rock item, and although they are waaaay out there, the items she's paired them with have the brilliant effect of toning everything down. Black hi-top trainers, that iconic Led Zep tshirt keep it casual. The shaggy fur amps up the luxe vibe and the polished black leather tote pulls it all together nicely and makes the whole ensemble look deliberate. At the end of the day, you do need seriously self belief to pull off sequinned trousers and make them look this good, not sure I could pull it off personally but the inner me adores this style. Bit more of a dressed down take on the look here. Slimline trousers pair well with the ultra-grunge of the waist tied plaid shirt- an absolute 90s staple. The glam element is brought to the table by the ladylike sheer chiffon blouse and the simple strappy sandals, but the hint of underwear showing backs up the subversive undertones. Her bag is the perfect bridge between the two worlds, with its shiny, metallic snakeskin finish (very glam, dahling!) roughed up a bit with that thick, punky chain handle. Perfectly dishevelled hair and shades complete the look. Sequinned mini + boyfriend tee + biker boots + statement necklace = perfection. I love this combination insane amounts. It's girlie yet tough, and oh so wearable. It indulges my outfit favourites - namely, getting my legs out, covering up my stomach, keeping my feet comfortable and lazy styling by the addition of an overwhelmingly fabulous necklace! Throw on either a shaggy fur or a leather biker and the look. Is. Nailed. Boom! This outfit is a twist on the above formula, adding feathers to the mix on the skirt and replacing the jacket options with an eye catching sequin blazer. I love the fact this is monochrome but the organge bag adds a shock of colour to make the outfit fresher. A similar idea, notched up a gear! What could be more grunge that the silhouette of a maxi skirt and sloppy jumper? But the blinding sequins bring the glam here! I just love the idea of pairing something as high-octane as a sequinned maxi with a plain slouchy jumper- great pairing. Extra grunge points if you manage to add in a beanie hat! Her smudged black eye make up that looks all slept in is also perfection. This outfit could work for day or night. 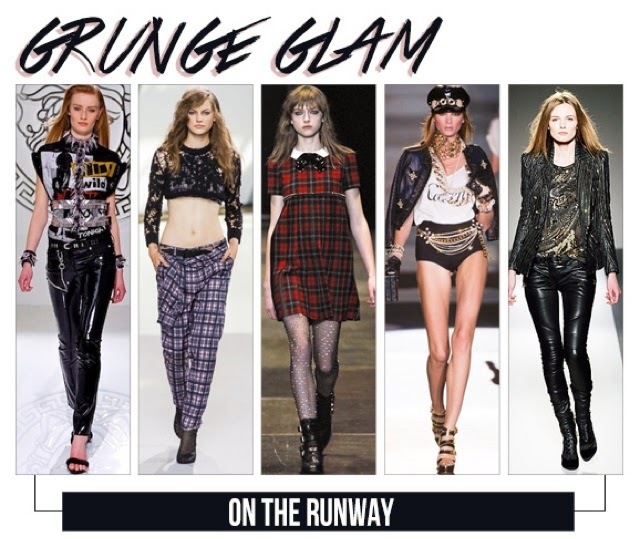 So you have your leather skinnies, black ankle boots, band tshirt - all the grunge basics. But the addition of a smart tailored coat in a rich burgundy shade adds a new twist and a bit of luxe. The coat's leather details tie it into the rest of the outfit and the leopard clutch is the icing on the cake- totally rock, totally polished. And no grunge glam post would be complete without featuring some Balmain, who basically own this look. The sequins, the body con frock with the achingly sharp shoulders and the distressed finish. Wow. Also the model's hair is my dream hair. 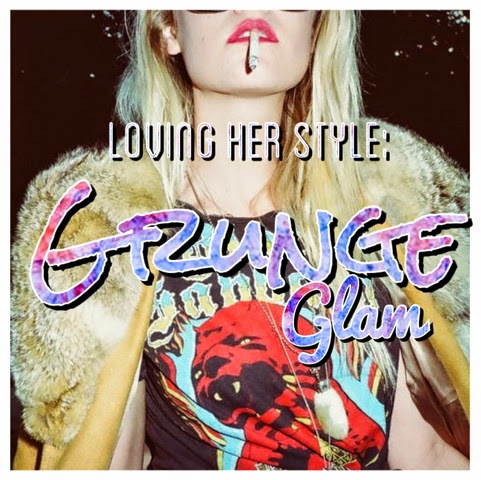 So, what do you think of grunge glam? How do you wear it? Any outfit recommendations for me? I'd love to hear your ideas! Totally agree Nina, there's just something deeply cool about the look. Its at least 2/3rds about the swagger though, I reckon! Great post! I'm loving all the sequins! - i'm a bit of a magpie!